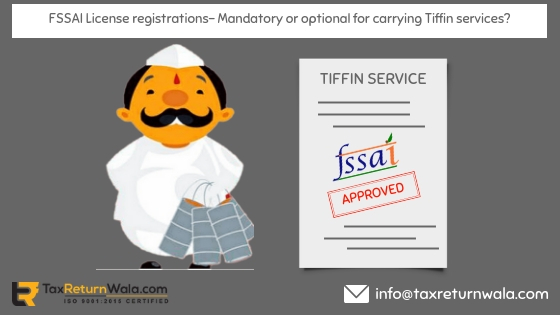 FSSAI License registrations- Mandatory or optional for carrying Tiffin services? As per FSSAI License Act (Food Safety and Security Standards Act) it is essentially required that every food business operator whether working on small or large scale, whether being engaged in manufacturing, storage, transportation, catering, sale of food ingredients, retailing, marketing, distribution of food products or any other means, he/she have to mandatory obtain a food license from a supreme authority after getting registered under state and central food legislation’s defined under the Act. Out of all food business ideas, the one which is getting more preference especially in metro cities is localized bodies of Tiffin service providers. With increasing number of Tiffin service providers and increasing price competition, it is being notified that every working employee and a daily consumer of these homemade food subsidiaries is being affected by the poor quality and hygiene they have. Considering health situation of a large of daily Tiffin consumers, government made it mandatory for all small food bodies to get registered under FSSAI. It is easy to get registered under FSSAI , as it only requires filling of an online registration form specifying all required details of business, adding few necessary documents of incorporation & other licenses and submission of declarations as per Central and State licensing format. On the basis of application made, FSSAI then grants authority approval. Every small food business operator should register themselves by submitting an application with form A along with fee prescribed. Registering Authority shall either accept or reject the application giving a recorded reason in writing or a notice of inspection. If accepted, the registering authority shall grant the registration certificate to be published/displayed on work floor anywhere, where actual business is done. The Registering Authority shall take inspection of the working premises at least once in a year. Form B duly signed and completed along with blueprint/layout of food processing/production unit. List of owners/directors with complete address and contact details. Government issued certificates, certificate of incorporation, detailed list of machinery/equipments used in food production and processing. List of food items prepared, list of surveyors appointed for sample checking, lab report of input material used in products. Proof of place of possession ex- rent agreement, electricity bill & complete information about the food safety management techniques undertaken. NOC from Municipal bodies, other government bodies in case of re-labellers etc..
Other documents as prescribed by registrar. Q1. My food business earns me an annual turnover of Rs 15 Lakh . Should I obtain an FSSAI License ? How ? Q2. Once applied, do I get an FSSAI License approval for my business lifetime? No, FSSAI License comes with a validity period of one to five years. The license needs to be renewed before 30 days of its expiry term. Q3. Do I need multiple FSSAI license for multiple Food Business Subsidiaries? FSSAI license registration is done for a single business unit irrelevant of the fact that it has any number of subsidiaries. While it also depends on the location of business, if multiple businessbusinesses are is done at multiple locations then separate registration is required for each location.